The Arts and Health Project: Healthy Aging through the Arts offers seniors weekly arts workshops with a professional artist, an intern artist, and a seniors’ worker. 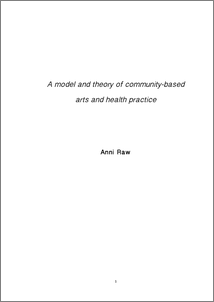 This contemporary research text introduces an emerging and rapidly growing field with a dynamic collection of illustrative articles contributed by leaders across many disciplines who use the creative arts in research and practice, among them leading academics and highly respected adult educators, artist/researchers, playwrights, directors and dancers, nurse educators, physicians, dietitians, social work educators, and environmental activists. Caroline Schofield invites people to drop by her studio in the WHAT Centre for Arts & Health, University Hospital Waterford on Thursday 20 October between 12 noon and 2pm to explore the name(s) they like to be called in an open studio event entitled This is me. This course involves the regular participation and contribution of numerous community partners (including local, national, and international arts organisations), leading mental health professionals, and applied theatre scholars and practitioners, representative of both of the MSc’s core fields.